Based on the notion that philosophical assumptions and educational aims are important factors that gear educational processes, this study focuses on the ways in which teachers' assumptions and goals regarding citizenship influence their teaching of civics. The research of this topic is pursed based on a set of comparative analytic case studies that observe different ways in which conceptions of the notion of good citizenship manifest in three Israeli high school civics classrooms. This study draws from the research traditions of grounded theory, the use of ideal types, as well as the principles of the qualitative instrumental collective case study approach. This study's main finding is the identification of a stark disparity between the conceptions of citizenship that are promoted in each of the three cases, despite the a-priori similarities between them. This disparity results in the enactment of very different types of civics lessons as well as influences the goals, the relation to the curriculum standards, and the pedagogies implemented in these three settings. As a result of these findings, three ideal types of citizenship and civic education (CCE) are presented, reflecting these different approaches: (1) disciplined CCE; (2) participatory CCE; and (3) critical CCE. The importance of these findings is in the illumination of a civic education gap, relating to these differences. Following the scholarly discourse surrounding this topic, this study contributes to the understanding that not only is there a gap regarding the civic experiences and opportunities to which the students are exposed, but that the fundamental meaning of the term good citizenship is interpreted and promoted in a varying fashion. This focus, on the ways in which these different conceptions influence and reinforce the reality of the civic education gap, forges the connections between these two fields of study, a connection that yet has to been acknowledged in the literature. In fact, this civic education gap implies to the contextual factor of social inequality as it reflects in the classroom settings, in relation to this specific subject matter. An explanation for this gap is the central role that the civics teachers hold, in relation to their students' opinions, academic levels and socio-economic backgrounds. 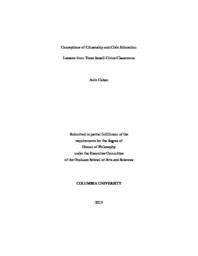 With the help of the theoretical concepts of civic abandonment and civic activity, which relate to the individual's civic identity in relation to the country in which s/he lives, this study documents ways in which teachers frame their civics lessons in congruence to their own perception of their students' civic orientations. In this manner this study points to the dangers of such a reality in which teachers choose to promote civic ideals that do not recognize the complexity and multiplicity of this topic. Based on these findings, a presentation of pedagogical strategies as well as a descriptive theoretical model of the civic education process will be brought forth, utilizing these different approaches to CCE. This presentation will potentially support teachers in designing holistic educational experiences that touch on a variety of CCE conceptions. This stands in contrast to the current reality in which such conceptions are dealt with as mutually exclusive. In this manner, this study promotes the belief that all students should have equitable access to the knowledge, values and dispositions that are crucial for any democratic citizen.